If you’re new to the world of cinephilia (cinema loving), you should know Michael Haneke is a European auteur critical-darling and frequent Academy Award and/or Cannes favorite. The Austrian filmmaker has built a renowned career on detailed, intimate slow-burners whose charm is in the cracks of cinematography most filmmakers overlook. Based on my experience with my first Haneke film in theatres, Amour (2012) I had a difficult time appreciating his devilish details while being so bored with the one-location story based on a pair of decrepit old piano teachers suffering from a stroke. Lead Daniel Auteuil searches for answers in the cryptic video messages sent by his family’s stalker. The problem with movies made by Haneke is that, to most viewers, they come across as stereotypical artsy foreign films — in other words, they’re boring to most everyone who’s not a passionate cinephile. His films are undeniably well made but also extremely slow. I myself had a little patience for Amour, and was more than a bit turned off by its overrated nominations at the Oscars a couple years ago, as it played to the depressing, personal suffering-narrative the Academy chaffs their pants for. 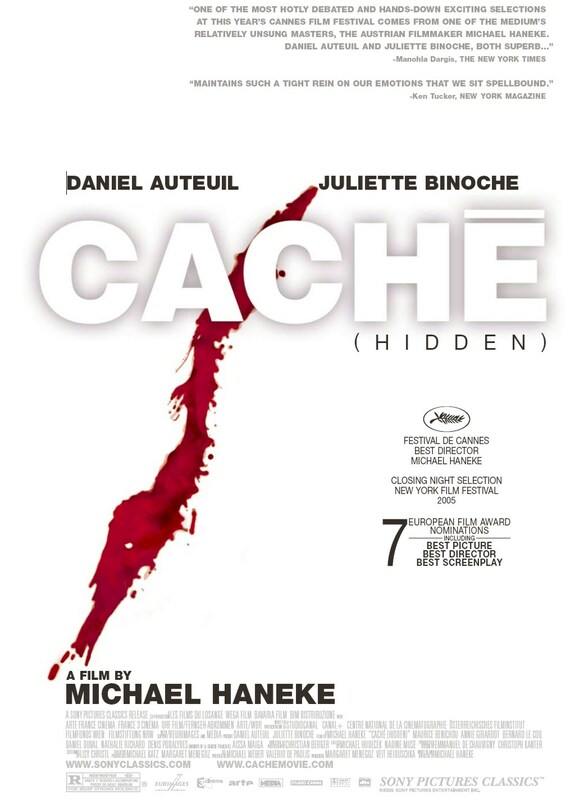 Much the same applies to this film, Cache, released almost a decade ago about a French family whose life becomes undone when an unknown stalker sends surveillance videos to their home. The film moves like molasses as do most of Hanke’s films, but one thing going for it over Amour is how its creepy premise gives the narrative a sense of danger, and therefore, excitement. The mystery driving the plot keeps you guessing without becoming a complete cocktease by the end. However, you do have to pay close attention to the movie at all times (particularly in the closing shots) and be able to put two and two together from the film’s flashback sequences and modern setting. One thing I will give Haneke credit for is that he doesn’t spoon-feed his audiences plot-points and expects his viewers to be intelligent in order to get the “message” of his film, or at least understand how the main themes of the narrative fit together. With that said, the downside of his complex, detailed cinematography and screenplay is that fully appreciating Cache is difficult with just one viewing; frankly, I’ve never been a fan of having to watch movies multiple times to understand the main plot. To me, there’s a difference between being smart, detailed, and subtle versus obscure, confusing, and dense, and sometimes Cache, like much of Hanke’s work, struggles to walk that tightrope. What pulls Cache together is that, in the end, the story makes sense — again, if you’ve been paying attention. Film academics preach not to approach movies like mathematical equations to be solved, as if only one “solution” or comprehension of a film is correct, and I respect that. However, there’s a middle-ground between mathematically “solving” films and drawing loose interpretations or incomprehensible meanings out of films for no reason other than liking a particular film’s aesthetic style. I’ve never understood why academics and cinephiles draw the line at over-analyzing movies with only “highbrow,” critically acclaimed art films, and not popular cinema. To me, films have to make some sort of concrete sense on some level, and the reason why I liked Cache is that, to a large extent, it does. However, that doesn’t mean it’s not incredibly slow at times, nor does that mean the frustration in figuring out what the hell is going on is negligible either. Cache’s flashback sequences are ominous and offer clues to the storyline’s present day-mystery. Bottom line: If you like patient European dramas, then you should feel right at home here, especially if you’ve enjoyed other films by Haneke. One attribute that should win over newcomers is the creepy premise and one particularly graphic scene that sends shockwaves through the rest of the film. However, I don’t think Cache tries in any way to make itself accessible to those without pre-inclinations to rewatch films numerous times. Experience it at your own risk, and be prepared to take notes. This stuff is well hidden. SUMMARY & RECOMMENDATION: Cache’s creepy premise and at times brilliant cinematography play with the boundaries of cinematic reality. It will also confuse the hell out of you, but oh well… Every character is well written and has a potent, meaningful impact on the story — though you might not realize it on your first time through. — However… the film’s dense plot and patient pace will irritate those who don’t want to watch this film like they’ll be quizzed on it later.
? Seriously, pay attention to the final frame. It’s all there.